Incline quarterback Dylan Cleary runs for a big gain against Valley Christian. INCLINE VILLAGE, Nev. — Speed kills but defense wins games. Incline scored a pair of defensive touchdowns and used speed to frustrate its larger opponent Friday, Aug. 24, and opened the football season with a 34-6 victory over the Valley Christian Lions at Highlander Field. 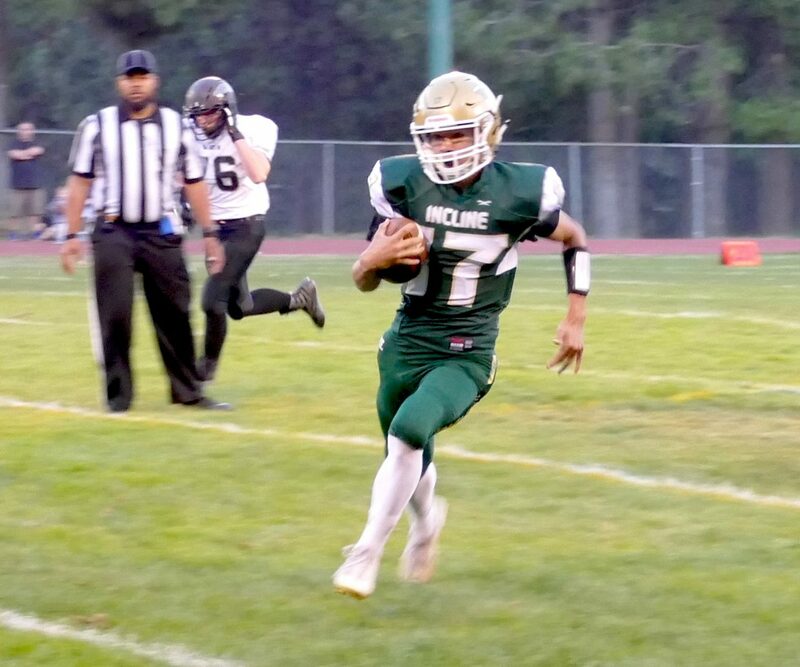 Incline juniors Kai Martinez and Zach Pexa each returned interceptions for touchdowns and quarterback Dylan Cleary threw for 186 yards and two scores and ran for another in helping the Highlanders pull away from the Lions. Incline relied on its defense throughout, but a strong start was key in the Highlanders leading 3-0 after the first quarter. The defense was led by junior linebacker Jorge Cardiel who made three solo tackles and assisted on eight others. He also recovered a fumble. Highlanders defensive linemen Topher Vaughn and Marco Barraza combined for five solo tackles and three quarterback sacks. Hard-nose defense upfront and good coverage by the Highlander secondary kept Valley Christian out of the end zone until late in the fourth quarter. Cleary completed 9 of 17 passes and also rushed for 73 yards, and sophomore running back Brad Rye had a team-high 80 yards on the ground on eight carries. Pexa was a standout player on both sides of the ball. Cleary’s top receiver hauled in a second quarter touchdown pass. Cleary kept the Lions defense guessing by spreading the wealth to six different receivers. No Highlander pass catcher had more than two receptions. Incline senior John Redfern made the other touchdown catch. The Highlanders this Friday, Aug. 31, will look to avenge last year’s 16-13 overtime loss to rival North Tahoe. Kickoff is set for 7 p.m. at at Highlander Field in Incline.